This book brings together insights from a range of disciplines, including law, sociology, criminology and history, to identify and explain the complex and inter-related factors which help or hinder the state to 'invest' in children and young people. The first part of the book examines the 'intangibles' - the ideologies, social constructions and moral precepts - which obstruct or encourage the passage and full implementation of legislation, policy and practice which hopes to improve the lives and prospects of children and young people. Notions of family and parental responsibility, assumptions about what children and young people 'are' and the extent to which they should be held accountable, and ideas around state investment against future risks are the key factors considered. The second part of the book focuses on the difficulties in practice of implementing policies aimed at investing in children's lives and futures. It reviews the role of science in the identification of risk factors related to poor outcomes for children and in the selection of target groups or areas for risk-based intervention to provide (early) support and preventative programmes for children and their families. 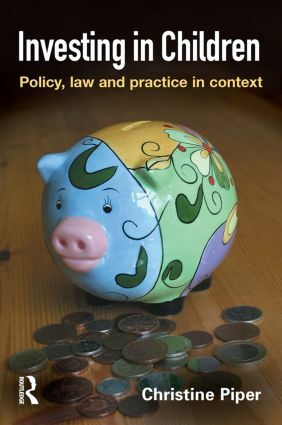 It also assesses whether and how law does or could help to 'deliver' an appropriate investment of time and money in children, with a focus on the existence and effectiveness of a rights-based approach. The final chapters examine the results of research so far undertaken done on selected programmes in the Every Child Matters, social inclusion and Youth Justice Board policy agendas and they indentify promising developments. However, they also draw attention to the alternative agendas around children and young people which are competing for government money and the public's support and warn that there are dangers in a child-focused policy whose justification relies so heavily on future cost savings stemming from the production of healthier, more employable and law-abiding adults. The right mix of parents, policy, science and law?